Can You grow your business without the internet? Welcome To Morgan IDS Inc.
We are full-service Veteran Owned Ohio Internet development company that started the business in 1996. Since that time we have continually expanded our services and development platforms. Our core business is custom programming Microsoft Net but over the years have expanded into PHP, Miva, Perl, and Java. Our software engineers provide expertise in Joomla and WordPress. A great deal of our time is spent consulting on not only the right programs to use for a site project but also on technologies and the demand by Major Search Engines on standards for websites. Clients tell me to talk about how spectacular our site look and perform but being a developer I like to talk about all the technical things we do that make our site function and rank in search engines as they do. Everything is in the details. We are experienced developers with 23 years in business and tons of experience. Our CMS is one of the best content management systems available today. We program in PHP, NET and other languages. We are experienced in updating and repairing WordPress, Joomla, and other free open source programs. The Internet has grown and so have we. We find our consulting to be one of the most valuable services we provide. We provide a free 30-minute review of your project or application. Online marketing is not only a skill it is also an art. Experience teaches what works and what is a waste of time and money. Digital Marketing is both affordable and effective even for small business. 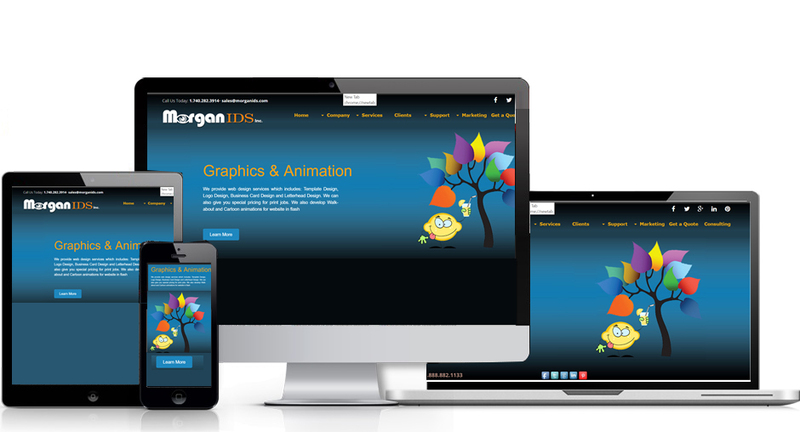 Your Site needs to be responsive! Not all companies use the same methods for providing mobile views of your website. We use only the latest and preferred technology available..
Use of our program is free, hosting is provided. Our tools are available to all. It means all our clients have equal success. HAs Morgan IDS convinced you? If so, click to complete our quote form or give us a call.